Recently on my Facebook page I posted a poll about the other things you like to do with your photos. Thanks for all the responses from the Photobookgirl community. I love hearing about all your creative projects! Canvas prints, mugs, magnets, video slideshows, phone cases, calendars, holiday cards, ornaments and prints were some of our readers’ responses. I’ve done everything on that list except for a phone case – although I’ve been tempted! One of my favorite personalized products to make during the holidays is Christmas tree ornaments. I started making them with newborn images of Photo Book Baby (who is now a grown up Photo Book Boy). Then of course I can’t forget about Photo Book Baby #2! The year my second child was born I looked at all the ornaments I had of my first and felt a little guilty about not having as many of my second born, but I’m happy to report since then, I’ve done a pretty good job at catching up! I also love making photo ornaments as presents for friends and family and especially to commemorate a baby’s first Christmas. New parents cannot resist a picture of their newborn! I always say personalized photo gifts are “can’t miss” gifts. 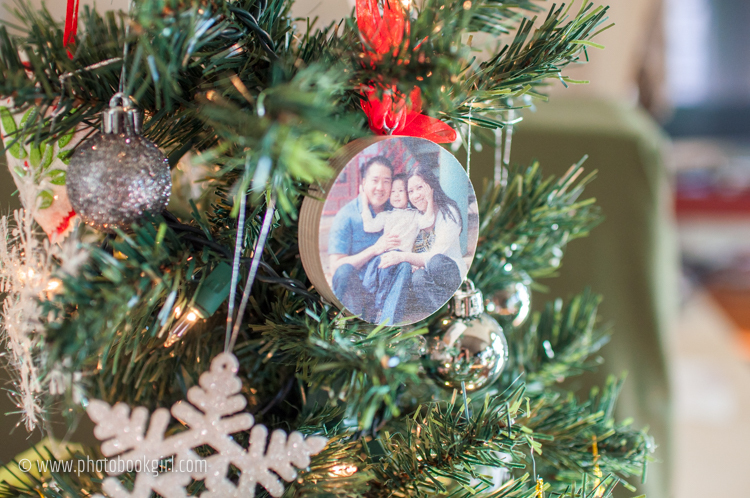 What I love about photo ornaments is how they personalize our Christmas trees and holiday decor. The first tree we had as a family was a last minute rush job. 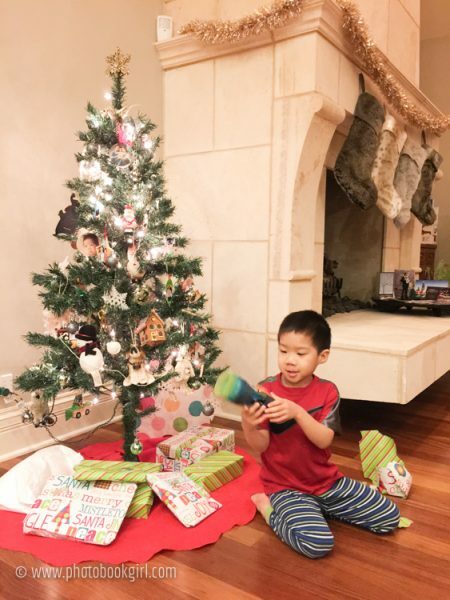 I recall my then two-year-old asking about a Christmas tree, so I scrambled to buy a modest 4.5 foot tree for about $20.00, picked up some ornaments from the dollar store and made photo ornaments using a wooden craft kit from Michaels. He loved it. Mama’s mission accomplished. We used that little tree as our main tree for three years! Below is a close up of the wooden photo ornaments I made with Photo Barn. They are cute, but a bit bulky. I made it work with our small tree though! As you know this blog consists of many of my personal projects so I can give you my firsthand review of the options. Here are my best ideas for making custom photo ornaments and some of my favorite places to make them! This is one craft I’ve done pretty consistently with my older son every year, especially for the grandparents and other close relatives. There’s nothing that grandmas love more than handmade gifts from their grandchildren. The bonus is when it includes a real life physical photo! (Not an emailed picture or a photo via text!) Print some photos either on your home color printer or online at any number of places: Mixbook, Shutterfly, Snapfish, Photobook America, AdoramaPix – basically all the photo book companies also print standard prints. Then just grab some fun holiday cardstock, glue the photos to the paper, add ribbon and you have an easy, affordable and personalized gift. 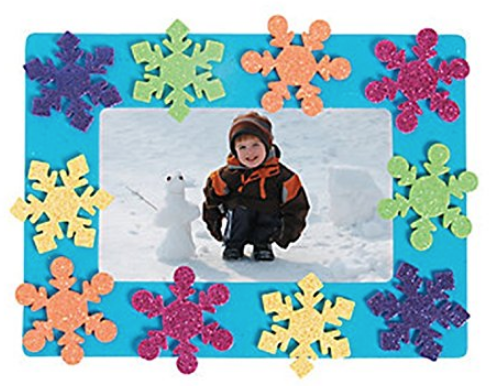 If you want some pre-made options, Michaels, Jo Ann Fabrics and other local craft stores have a lot of affordable photo ornament craft kits on sale. I also found these cute options on Amazon. 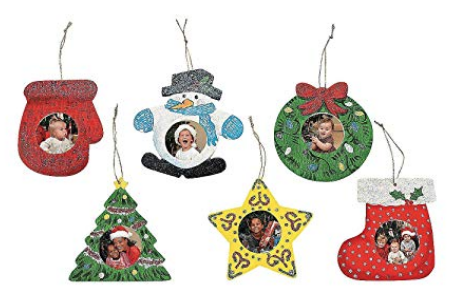 These average from less than $1.00 to $5.00 per ornament. Most are under $2.00 each. It’s the photo you add that makes it priceless! 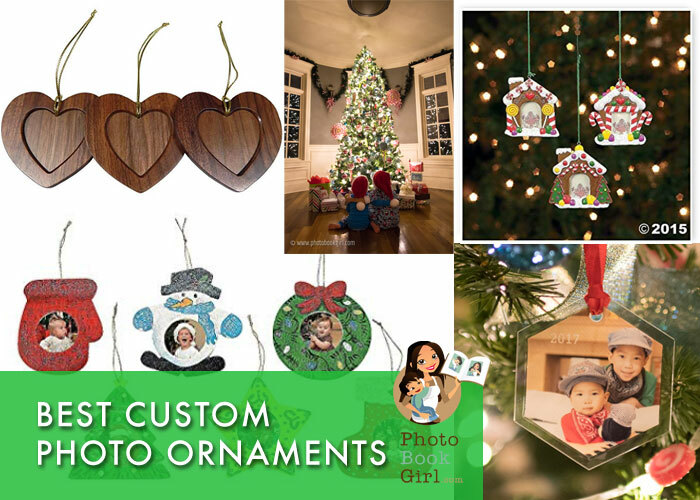 These cute wooden photo ornaments come undecorated but you can add your own personal touches. 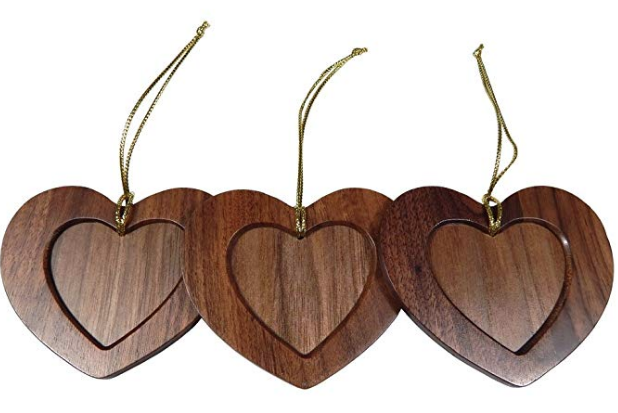 These wooden heart ornaments are simple and charming. All you need is to add your fave photos! 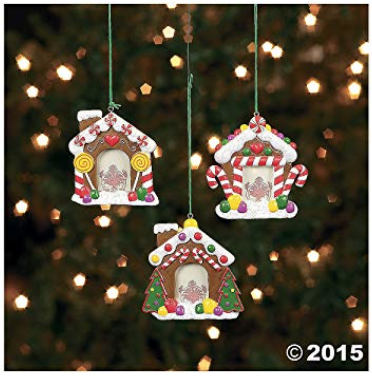 These have a magnet on back, but you can also add a ribbon for hanging. Self-adhesive stickers make it easy for young children to do this craft. I bought these super adorable gingerbread ornaments for our holiday party last year. I did a mini photo shoot for each friend and their little ones, printed the photos on my home printer and sent them home with a cute personalized party favor! They went great with my Candyland decorating theme! This theme was so fun to do. 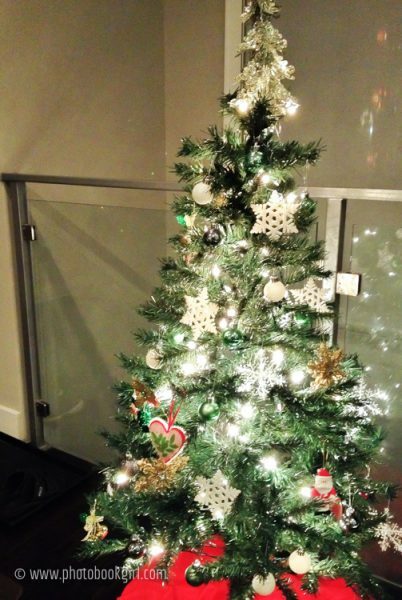 I know you can’t see them in my photo of our tree below, but I assure you there are several ones of my little guys. These classic snowflake ornaments would be great on any tree! 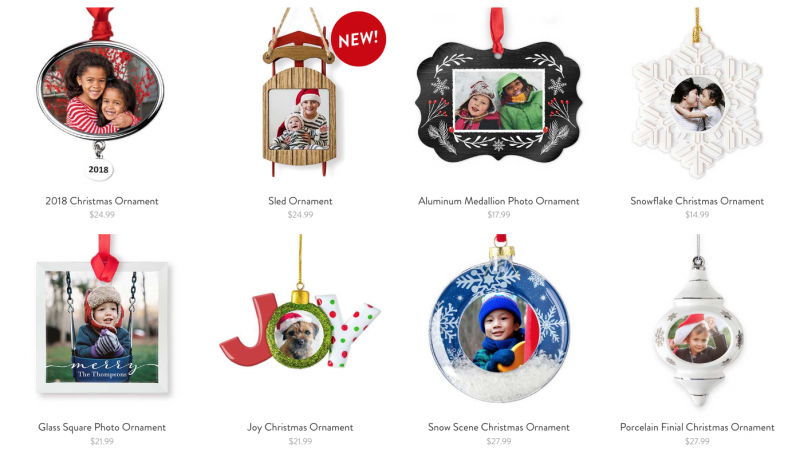 The options for custom printed photo ornaments are vast. You can have your photos printed on wood, metal, glass, porcelain, ceramic, pewter and more. The following are some cute options from Shutterfly. 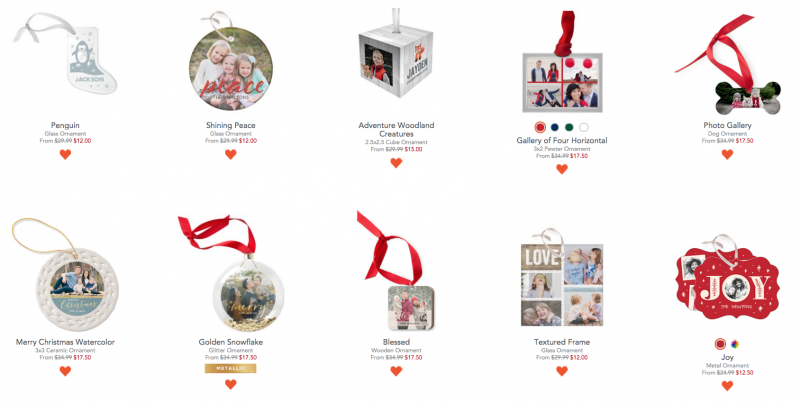 As of the date of this post, Shutterfly is running a 60% off sale on ornaments. They run $12.00 to $17.50 each, with discount, before shipping and taxes. Here are some options from Snapfish. Snapfish is running a 70% off sale on ornaments. With the discount, prices run $4.50 to $8.40 before shipping and taxes. I’ve made photo ornaments with Photo Barn, Shutterfly and Snapfish and I would say out the three, I like Snapfish’s glass ornaments the best. The glass one I ordered from Shutterfly was 3 inches square so it was a good size and of good quality however the due to the printing method, my photos came out muted and not as vibrant as I was expected. 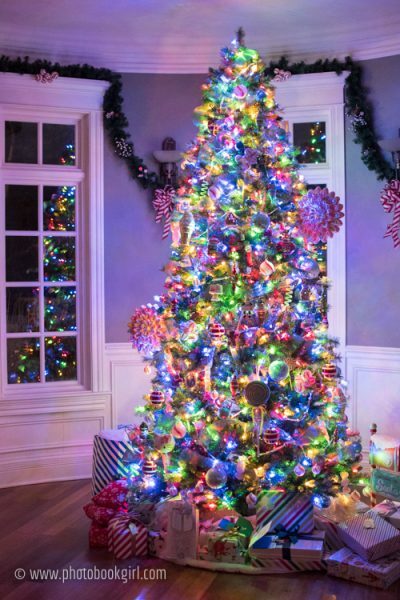 I feel like the ornament was a bit lost in the tree because the image was translucent and you could see behind it. In contrast the glass ornaments from Snapfish appear to be printed on a solid white background so the image stays bright and vibrant and is not translucent. One of my Snapfish ornaments from last year is below. I like adding a year on the photo for future reference which you can do within Snapfish’s software. There are lots of templates from which to choose and you can customize any text you might want to add. I liked them so much, I ordered three more using photos I took this year! I also made several as gifts for friends. 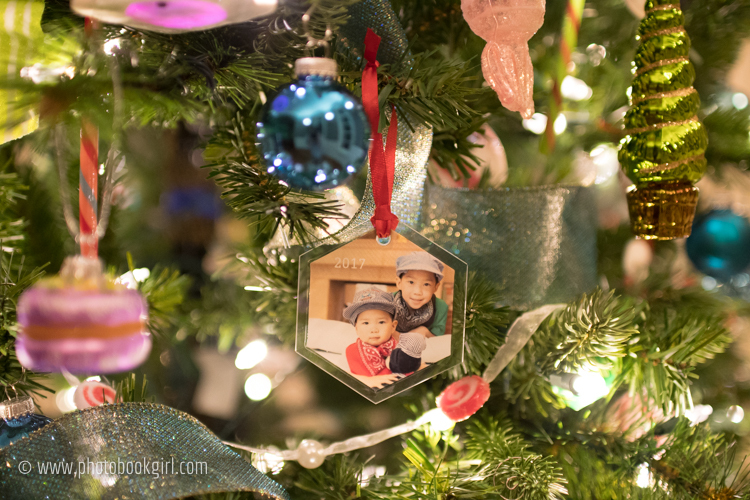 Be sure to also check out my related post on photographing children and your Christmas tree! I’ve certainly gotten better at taking photos of my tree from where I started. You can too! Also, be sure to check out our deals page for the latest discounts before you order!